Tustin, CA – October 29, 2012 – ViridiSTOR LLC announced that it provided its services for the Fisker Owners Event on the October 25, 2012 held at Fisker of Orange County. The ViridiSTOR USB was provided to an interactive guide of owner information in addition to product information to owners and invited guests. Marcelo Sandoval, Sales and Finance Manager, hosted the evening’s event. “After seeing how attendees received the ViridiSTOR solution at a recent event, and how the Fisker story was told, we knew we had to work with ViridiSTOR,” said Sandoval. “They not only included all of our marketing materials for the Karma and future products, but included the key owner information. With the Fisker-ViridiSTOR USB, our owners were able to take away ‘everything Fisker’ on the USB including ‘how-to’ guides and videos to maximize the enjoyment of their Karma,” commented Sandoval. “After meeting with the Fisker team and understanding their drive towards sustainability, it was clear we should work together,” Mullin continued. “Fisker’s commitment to ‘responsible luxury’ and sustainability made our fiscally sound solution even more compelling to their owners and clients. And using the power of our Presenter application, finding and using the information has never been so easy or intuitive,” Mullin added. 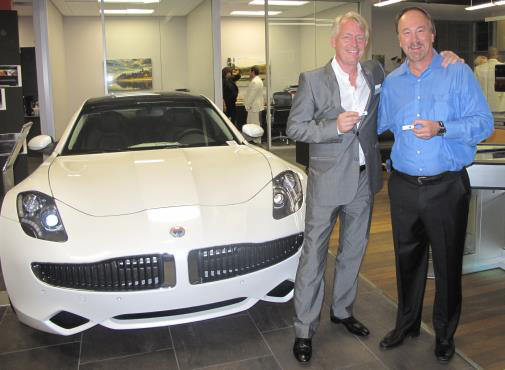 The Fisker Owners Events provide owners and invited guest an intimate setting to learn more about the Fisker line. Mrs. Fairuz Schlecht, Director of Color and Material Design, and Mr. Alex Klatt, VP of Global Design, were the evening’s presenters. They shared the designers’ unique inspiration behind the timeless beauty captured in the Fisker Karma. At Fisker of Orange County, we strive to build relationships that are consistent with our core values as we seek to fulfill the needs of every customer. Our dealership has built a solid reputation on providing courteous, honest service. We never lose sight of what makes us successful: our Customers, Employees, Business Partners and Investors. Because of this, we have seen a proven track record of success spanning 19 years. This is why we strive daily to exceed our customer's expectations.